As we approach the end 2013, AC Nielsen released a range of year-end data. And in my opinion, things are not looking that good for the tech scene. It feels like we are moving backwards with that few tech giants consolidating the market. Although these data sets focus on US metrics, it would be interesting to see that the tech giants are the ones topping the charts and with Google having 5 of it’s services on it1. Startups occurred because we believe we could disrupt the traditional industry. But what seems to be happening now is the consolidation of the tech industry. Once a potential startup emerge, the tech giants would buy them over. This is of course great news to the startup founders2 but may not be true to the tech scene as a whole. a question to ponder about? As the consolidators (tech giants) grow stronger. Will it kill the competitiveness in the tech industry? 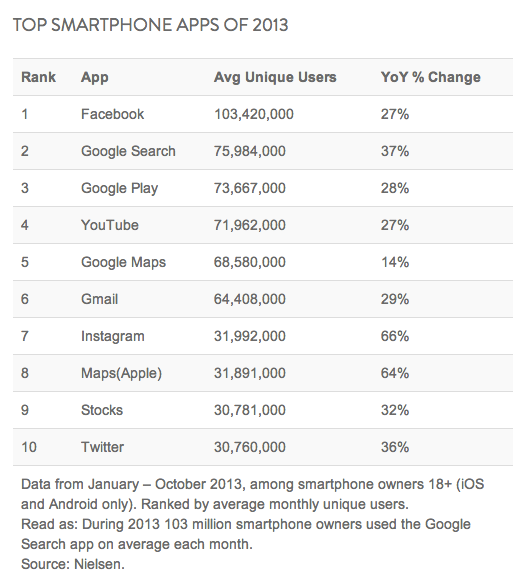 My two cent hypothesis: With Google having 5 out of the top ten apps in 2013, they are collecting much data about us, that maybe they more about us, than us knowing about ourselves. Plus with all the data they have on thier hands, they can produce better serach results and thus having a better search experience for the users. If this is the case? Can there be another service better than Google Search? Or can there be another e-commerce site as big as Amazon? Also if we were to know that we have little chance of winning the giants, will startups be created with the intention to be sold to tech giants only? What about the dream to grow a big company or even a 100 years old company? What are you thoughts? Love to hear your views.